A look at deck plans of ships in the brochure of a cruise line often reveals designs that have been ‘maxed out’ by adding an additional deck with cabins or lengthening the hull of later units of a class of otherwise similar ships. While ‘maxing out’ means that some design work does not need to be done, quite a few things change, and significant design work is still needed to ensure that everything will continue to work as it should, under every circumstance. Generally speaking, adding a deck to a vessel will increase resistance more than lengthening the vessel would, says Marit Holmlund-Sund, senior manager of marketing and communications at Finnish technology company Wärtsilä. “Lengthening the hull may even reduce the resistance. However, this is a general statement; each hull is different and the change in resistance that would follow the addition of a deck or lengthening the hull has to be checked in each case,” she comments. However, adding capacity to later units of a series of passenger vessels does not necessarily require more propulsion power. Holmlund-Sund comments: “The power plant is designed so that the vessel will meet the trial speed, which has been specified in the building contract.” As such, because ships do not operate at this speed in normal service, but at a lower speed, there is some reserve power in the design of each power plant. Examples of baseline vessel designs that were later lengthened include Royal Caribbean International’s Voyager class that was built in Finland at the turn of the millennium: each original ship had a length of 311m and capacity for about 3,100 passengers. The stretched Freedom class that followed in 2007 is 339m in length and can accommodate 3,600 passengers. TUI Cruises, the German premium market operator, decided to increase the length of its two final newbuildings in a series of six ships, also in Finland, by about 20m from the 297m of the first four ships. This will add 180 cabins to the two final newbuildings, which will have accommodation for 2,894 passengers and enter service in 2018 and 2019, respectively. Building later units of a class of ships longer than the original design raises a number of structural and stability issues, notes Finn Wollesen Pedersen, CEO of the Danish consultant architects Knud E. Hansen. The company has been involved with the cruise industry since its inception in the late 1960s and the ships it designed for companies like Royal Caribbean Cruises Ltd (RCCL) and the then Norwegian Caribbean Line (now Norwegian Cruise Line) played a pivotal role to launch the industry in its present form. “Many ropaxes are designed with lengthening later in mind,” Wollesen tells The Naval Architect. “In addition to global strength of the hull, fire zones come to the spotlight when a vessel is being lengthened, be it an existing vessel or a design that is on a drawing board. The zones will change as the vessel becomes longer. Whether lengthening or adding a deck, a further challenge emerges from shipboard systems. An additional cabin deck on a major cruise ship can add 500 lower berths to its capacity and a few thousand gross tons to the vessel. A longer hull has similar effects, depending on the additional length. “All systems for environmental technology, processing waste water, food waste and garbage, are designed for the number of people aboard the ships. There may be some overcapacity in such systems to accommodate a certain increase of passengers, but in many cases, it will require upgrades such as increased tank capacities, process volumes, increased capacity on pumps and other process equipment to handle larger flows,” says Henrik Badin, CEO of Scanship Holding, a Norwegian company that supplies solid and liquid waste treatment systems to ships. The capacity of shipboard systems, ranging from power supply to HVAC, on board store rooms and waste handling all need to be looked at. “Black water capacity is an example of what needs to be thought of: you cannot pump it to the sea near a coast,” Wollesen points out. The layout of the sprinkler system must also be reviewed. The shipboard systems also have to work properly in emergency situations on a ship that is larger than its baseline design. “When you add capacity to a vessel, you need to rethink the entire safety strategy,” Wollesen continues. Wollesen worked as project manager of HVAC of Princess Cruises’ 2,600 passenger capacity Grand Princess of 1998, a baseline design that was itself ‘maxed out’ in 2004 by the 3,100 passenger Caribbean Princess that has an additional deck of cabins. The former vessel uniquely had its Safety Management System tailored beyond the rules and regulations as they stood at that time. Wollesen says: “A lot of effort and resources were used by yard, suppliers and owner on the task… On that ship, the hallways and corridors were overpressurised by the air conditioning system in case of a fire in a cabin, to keep the smoke in the cabin.” With their larger capacity, later units of the same class required an assessment of the air conditioning system, to ensure that it could perform this same procedure in a cabin fire emergency. On the other hand, optimising the capacity of onboard systems does not necessarily mean maximising them, and there remains the prospect of increasing the capacity of a ship design – or later units of the class – at some point in the future if the owner believes this is a viable option. “If the systems are not optimised to meet the demand on board, they will not be energy efficient,” Wollesen pointed out. From a financial point of view, lengthening an existing ship can cost almost as much as a newbuilding, but the former allows the owner to get additional capacity much quicker than if a newbuilding was ordered. Increasing the capacity of later ships in a series means increasing the revenue base without a need to start from a scratch with an entirely new design. However, significant work is still needed on the design side, irrespective of whether an additional cabin deck or lengthening was opted for. From a passenger point of view, the latter option offers an advantage: it means increasing both the outdoor deck space and indoor public areas. This is not the case with additional cabin deck: balconies of cabins are virtually the only additional outer deck space that results, while the indoor public areas do not increase, yet have to be shared with more passengers. As cruise lines have become more flexible in integrating the outer decks and adjacent service areas like bars and buffet restaurants, earlier used only in the daytime, to the evening programme on board, the need for additional public areas to respond to higher passenger load has been partly mitigated. 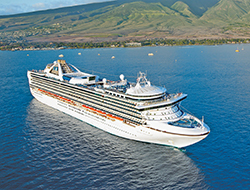 While there is heavy demand for outdoor deck space on cruises in warm regions in particular, designers of large cruise ships have taken different approaches towards providing it in the recent past. On some vessels, the boat deck level is almost entirely out of bounds for passengers, which means that the pool deck areas that are usually located high up in the vessel must satisfy this demand. However, it would seem that designers are waking up to a need to provide outside deck areas not just for sunbathing but also for facilities such as restaurants and bars. This has resulted in a number of vessels that have several of these outlets a the boat deck level. The Breakway and Breakway Plus series – in which a cabin deck was added to the earlier baseline design – of Norwegian Cruise Line, and MSC Seaside of MSC Cruises (which boasts the highest ratio of outdoor space of any cruise ship at sea) are examples of such designs. The new, larger locks of the Panama Canal have removed the need to confine the beam of cruise ships to 32.3m (the maximum width of the old locks), although cruise liners wider than this have been built since the late 1990s. Wider hulls mean more space inside and a greater outdoor deck area as well. However, as inside cabins fetch the lowest price, the additional space on cabin decks that can follow from wider hulls is not a major advantage. While technical areas, like piping and ducting can be placed here, the cabin block above the hull is actually slightly narrower than the hull itself on many recent ships and the superstructure widens again further up on the pool decks.